Pier Paolo Pasolini is best known to American audiences through his films--from The Passion According to Saint Matthew (1964) and The Hawks and the Sparrows (1966), to Il Decameron (1971) and Salo (1975). One of the great Italian artistic and intellectual figures of the 20th century, he was also a major Italian poet and an artist of remarkable interdisciplinary range--he was additionally known for his work as a screenwriter, theatre critic, playwright, essayist, journalist, graphic artist, and novelist . Coordinated by Director of the Center for Visual and Performance Studies Mark Franko with literature professor Deanna Shemek, the conference will include presentations by scholars from around the world in four different sessions. There will also be a screening of Pasolini's Arabian Nights on Thursday, April 28 at 7 p.m., and Notes on an African Orestes, on Friday April 29, at 5:30 p.m. Both films will be shown in Studio C of the Communications Building. “The Center for Visual and Performance Studies has chosen to focus on Pasolini for its upcoming conference because of his wide interdisciplinary range,” Franko noted. The Center for Visual and Performance Studies is a faculty and graduate student research group established in 1996 to bring interdisciplinary activities in the arts, humanities, and social sciences into greater visibility at UCSC. Today it serves as a collaborative research and programming "think tank" for faculty and graduates from 13 departments. VPS is dedicated to the support of graduate students and faculty engaged in research and writing on any area of visual and performance studies, including dance, texts, digital new media, moving image media, and works of art. 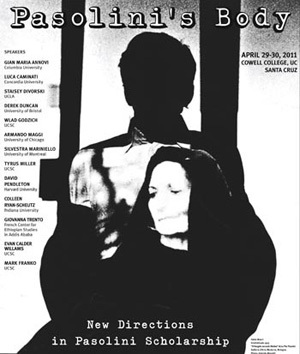 This conference is sponsored by the UCSC Arts Division, Arts Research Institute, Istituto Italiano di Cultura di San Francisco, Cowell College, and the Theater Arts, Literature, Film and Digital Media, History of Art and Visual Culture, History of Consciousness, Feminist Studies, and History departments. For more information and a complete schedule of speakers, visit the Center for Visual and Performance Studies web site.